Wild pigs inhabit vast areas in Europe, Southern Asia and Africa, and have been introduced in North and South America, while feral pigs are widespread in Australia and New Zealand. Many wild pig species are threatened with extinction, but Eurasian wild boar populations, however, are increasing in many regions. 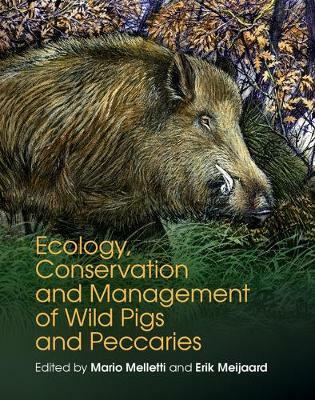 Covering all wild pig and peccary species, the Suidae and Tayassuidae families, this comprehensive review presents new information about the evolution, taxonomy and domestication of wild pigs and peccaries alongside novel case studies on conservation activities and management. One hundred leading experts from twenty five countries synthesise understanding of this group of species; discussing current research, and gaps in the knowledge of researchers, conservation biologists, zoologists, wildlife managers and students. This beautifully illustrated reference includes the long history of interactions between wild pigs and humans, the benefits some species have brought us and their role and impact on natural ecosystems.